The Let’s Play™ Card Games collection brings together award-winning favorites, and delightful new concepts that deliver affordable family fun for everyone! The Let’s Play Card Game 12-unit display comes pre-packed with three units of each: Duo™, Continuo®, Tripolo™, and Flip Six™. With over 6 million games sold worldwide, best-selling Continuo has been updated for this special set. Created by Maureen Hiron, Continuo and Duo have received numerous prestigious awards including Mensa Best Mind Game, Games 100 Selection, and Dr. Toy Awards. Duo now includes wild cards and two different ways to play. In regular Duo, players take turns matching two out of three elements to be the first to discard all their cards. In Demon Duo, there’s no waiting for turns! 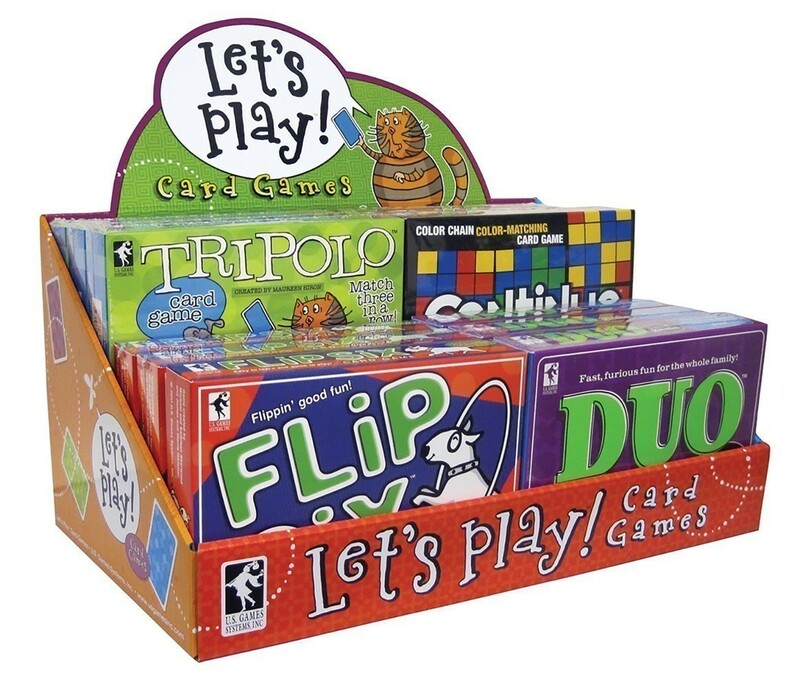 There are four additional family games that are designed to fit in the Let’s Play Card Games display: Nutty Neighbors™, Wizard Card Game®, Bing-o Cards™, and Royalty® Word Game. W 13.5" x D 8.25" x H 11.75"